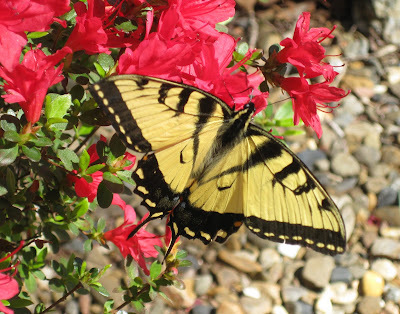 I took this pic outside in Arkansas-the butterflies were everywhere. I finally feel like it's spring! I did do a little thrifting when I got home. 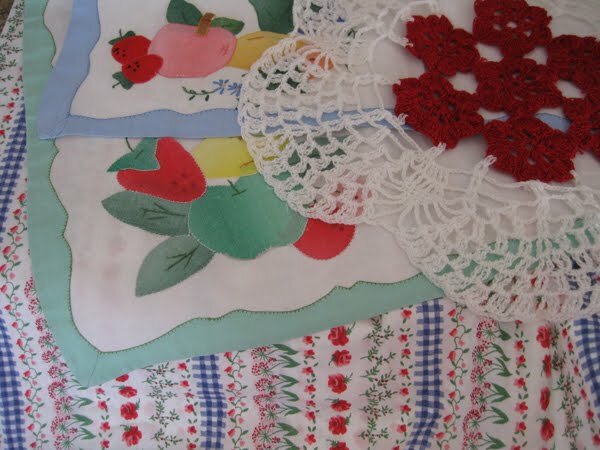 I love this pillowcase and the little applique placemats have a slot to put a napkin through. I have lots of pieces like this with fruit and flowers. Love the colors. I plan on doing some tiny projects-like painting these little ornies up. Still working on my stitching. I'll share the progress soon. It's so good to be home!!!!!! In Holland we have a proverb: East West-Home is the best! Welcome home. Wish you a beautiful weekend and a HAPPY EASTER with heart&soul from Sil. Ahh, glad things are better w/ your dad...having in home care will help. Love the beautiful butterfly! I'm looking forward to seeing some around here! Glad to hear that your Dad is out of the hospital and back home, Leslie. I know how stressful that can be, so it's good to see that you did some thrifting and that you're back to blogging! Welcome back to Blogland. Glad you dad is out of hospital. Ir must have been a stressful three weeks. Love your new thrifted items. Welcome back. The butterfly photo is just stunning. Would love to see what you do with the painting project there. Glad you're home and that your dad is getting some good care. Lovely finds and I can't wait to see what you do with those ornaments. We are glad to see you back, and hope that everything is well. 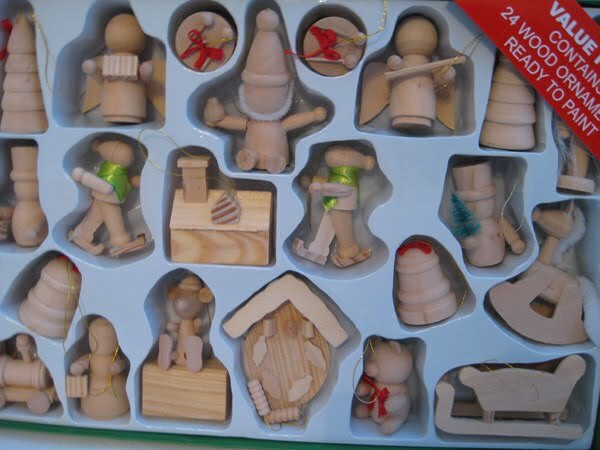 Those little wood ornaments look like they will be alot of fun to paimt! We can't wait to see your new sewing projects!